This reclining sofa features three seats (three of which recline). It is crafted by a manufacturer who places its focus on reclining furniture. The casual contemporary style will give your living room a bit of lift or add some style to your family sitting space. Power adjustable headrests allow you to adjust the angle of the headrest's tilt so that you have it at the perfect angle for video viewing or relaxing. 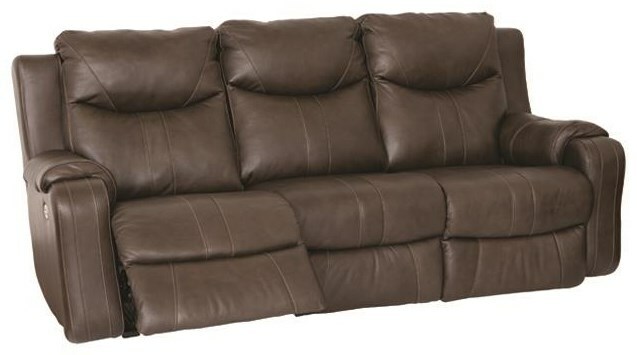 This reclining sofa is available in a large assortment of upholstery options through special order methods. The Marvel Double Reclining Sofa with Power Headrests by Southern Motion at Darvin Furniture in the Orland Park, Chicago, IL area. Product availability may vary. Contact us for the most current availability on this product. Arm Track arms offer a contemporary style while soft, pillow-like padding keeps items in this collection feeling comfortable. This reclining furniture collection is brought to you by one of the most well known names in the reclining furniture industry. Reclining furniture is all this manufacturer does, so they know how to make a stylish piece that is comfortable and durable. This collection features a cool contemporary style. Each piece is padded to perfection for comfort and added features on some of the items like power recline and power adjustable headrests make this collection a king in its category. The Marvel collection is a great option if you are looking for Contemporary furniture in the Orland Park, Chicago, IL area. Browse other items in the Marvel collection from Darvin Furniture in the Orland Park, Chicago, IL area.